The dice game Farkle, also known in the gaming realm as Farkel, Zilch, Wimpout, 10,000, and 5,000, involves the throwing of six, 6 sided dice and using paper and pen for scoring. A traditional folk game with unknown origin, Farkle has many variations of play, though many prefer the standard rule system outlined below. Even dice loving gamers may not have heard of Farkle with its popularity not quite to the level of other dice titles such as Yahtzee or Boggle. Play for Farkle is undertaken by two or more players, each of whom throw the dice with the aim of accumulating a specific score (usually 10,000) by using the traditional Farkele score accumulation table. Play takes place in a clockwise motion, with the decision to play on or accumulate left up to each player. The game of Farkele can be given home rules by simply tweaking the dice combinations that lead to a specific score. As far as home rules go, an example would be that in the standard game of Farkle throwing three 1’s will result in the score of 1,000 points, some home rules may have this higher or lower. The game of Pocket Farkle states three 1’s will score the player 300 points as opposed to the standard 1,000. As you can imagine this set up means that home rules can be based on merely adding new combinations or changing those in the existing Farkle score table. The true skill in Farkle is a little like Poker, you need to know when to hold them, or when to fold them. If the player accumulates points and puts those dice aside, they can continue to throw the remaining dice to try and up their score, if however they throw nothing, they have Farkled and even those points set aside are lost. 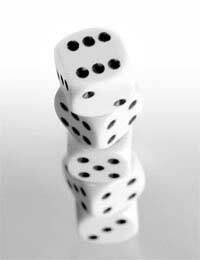 If, on the other hand, all 6 dice thrown score something, the player has Hot Dice and will get to throw all 6 dice again. Each scoring combination takes place in one throw. So for example, if you put aside two individual 5’s and then threw another 5, the score for the initial 5’s set aside is 100 (50 points each) and the new 5 thrown does not get added to that making three 5’s and thus a score of 500. This additional 5 stands alone and therefore is only an additional 50 points, thus giving a total for those dice of 150. It sounds a little confusing, but just use the table and remember scores are not accumulative, once you’ve put dice aside, they do not add to the new throw. As already mentioned, Farkle is simple to modify and new scoring tables written. Some of the more obvious additions to house rules include the addition of a straight throw (1,2,3,4,5,6), which scores the player a whopping 2,500 points. Other variations to Farkle include additional points for specific combinations, for example you may reward the player additional points for doubles and triples thrown. One popular addition is the triplet’s rule, in which a player throwing two triples (for example 2,2,2,3,3,3) is awarded 2,500 points. Part of the fun of Farkle can be making up your own scoring / house rules. As you can tell this is simple to do, thus making Farkle fun for the entire family.